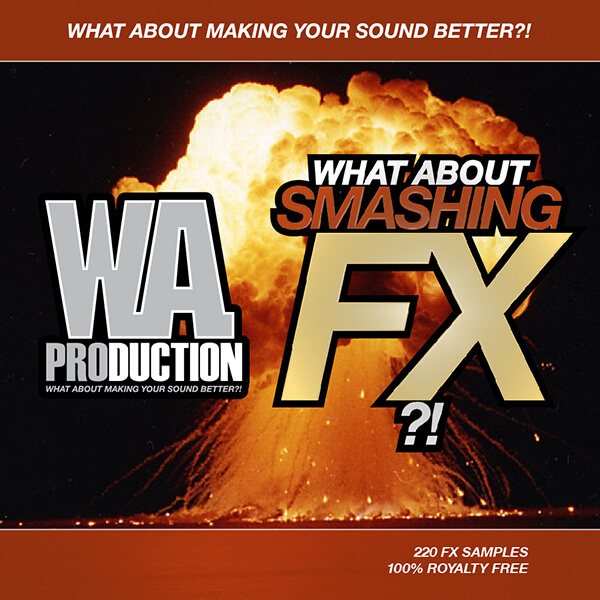 ‘What About: Smashing FX’ is a brand new pack from W. A. Production that contains 220 FX Samples made for all modern EDM genres such as Electro, Progressive, Deep and Tech House. In this pack, you will find a big collection of Build Up Kits, Impacts, Uplifters, Downlifters and Short FXs. Every single sample is made to bring more tension and freshness to your mixes. All 100% Royalty-Free. ‘What About: Smashing FX’ contains all Sound effects that any modern producer needs to own and to use in creating new and awesome tunes. Featuring four and eight bar Uplifters, playful Downlifters, a whole bunch of different Impacts (including sub basses, noises, reverbs etc. ), short and punchy FX and very useful and powerul Build Up Contruction Kits. Every Kit is separated into a few stems so you can play with them and use them as needed.